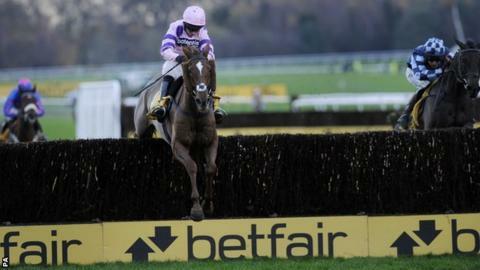 Silviniaco Conti beat Menorah to give trainer Paul Nicholls his sixth win in the Betfair Chase at Haydock. The King George VI chase winner, ridden by Noel Fehily, won by two lengths at odds of 100-30, with Dynaste third. Last year's Haydock victor Cue Card faded, while Taquin Du Seuil and Harry Topper were pulled up. Meanwhile, Champion Hurdle hopes The New One (at Haydock) and Faugheen (Ascot) both claimed comfortable victories. Silviniaco Conti, winner of the Haydock race in 2012. was back to his best after a curious display in last season's Cheltenham Gold Cup, when he finished fourth but inexplicably lost his way along the run-in when in a commanding position. "A few things didn't go to plan last season and I don't know what happened to him at the last in the Gold Cup," said Nicholls. "But when I saw he had his ears pricked today I knew they wouldn't get past him. "A really professional success by Silviniaco Conti to grind it out for Haydock's top jumping prize again, and set himself up nicely for the King George at Christmas, when stablemate Al Ferof could be a big challenger judged on his Ascot win. "Special mention goes to gallant runner-up Menorah who was upsides at the second last, before not lasting home as well as the winner, while Dynaste (third) and The Giant Bolster (fifth) ran with considerable promise." "We went for headgear with See More Business (1999 Gold Cup winner) and left it on him and we put cheekpieces on him (Silviniaco Conti) so I think we'll leave them on." After The New One won at Haydock under Sam Twiston-Davies, his trainer father Nigel said he plans to run six-year-old, last season's Champion Hurdle third, in next month's International Hurdle at Cheltenham. Al Ferof, third in the King George at Kempton behind Silviniaco Conti, won the Amlin Chase at Ascot for Nicholls. He was part of a treble for jockey Ruby Walsh, who also scored with the Willie-Mullins Champion Hurdle favourite Faugheen, and novice hurdler Fletchers Flyer for Harry Fry.